Baby star tortoise care is very important. Your heating source should be positioned at one end of the vivarium, creating a hot basking end. At the center point in your vivarium the thermometer should read 80-82°F give or take a couple of degrees Fahrenheit and should be maintained for 24 hours a day, the best way to achieve an accurate temperature is with a thermostat. UV lighting is essential for 12-14 hours a day. The UV tube should be placed just below the ceiling and should start against the wall at the hot end and span 2/3 the length of the enclosure thus creating a UV gradient much like your heating. It is best to position your UV tube 6-9 inches from the ceiling of a 2ft high vivarium. However a word of warning. Always remember to replace your UV tube every 6 months unless the manufacturer suggests otherwise. There are several good substrates for tortoises, a good quality orchid bark is recommended, and it is certainly the best for tortoises from humid regions (Herman’s, Spur thighs and Marginated). When using damper barks always increase your ventilation, not doing so may rot your wooden vivarium. Tortoises from dryer regions fare much better on beech chip (Horsfield’s). No tortoise should be kept on sand, gravel or peat. Spot clean your vivarium regularly, if done properly a full vivarium clean should only be necessary once a month. Only use disinfectants specifically designed for reptiles. Soap, detergents and other disinfectants can be toxic to your animal. Always provide your tortoise with clean fresh drinking water; tap water is fine, although there are water treatments available if in doubt. Always get all your tank furniture from a recognized dealer, and remember tortoises eat plant matter, don’t use any live, plastic or silk plants. Tortoises should be given 3 wet meals a week and access to as much dry food as it likes. A tortoise’s wet diet is made up of 90% leafy greens, such as Rocket, Endives, various salad leaves and selected weeds. The final 10% is made up of fruits and vegetables to add colour and flavor. See later list and online guides for safe foods. The dry part of its diet is very important. The hay used as bedding can be eaten and chopped to mix with the wet food to add a little more roughage. Alfalfa can also be left in the enclosure or mixed with the wet food in the same way. As a general rule we like to leave a good dry pellet food in the enclosure at all times. Do not add too much water. The point of this is to allow your animal to fill up on a low water content food so they don’t gorge themselves on high water content foods. It’s worth noting that the Tortoises mentioned in this care sheet come from fairly arid regions and eat a large amount of roughage. They come across very little fresh growth other than early spring and can only find fruits when they fall from their plants for a very brief period of the year. A high moisture diet is a common cause of growth deformities such a shell pyramiding. It is worth remembering that if you take foods from outside to check no pesticides or fertilizers have been used nearby. Also never give your animal anything from the side of the road due to exhaust fumes. The best way to judge what quantities of vegetable matter constitutes as a meal, is to put a sizeable amount of food in the enclosure, in the morning and remove it in the evening. 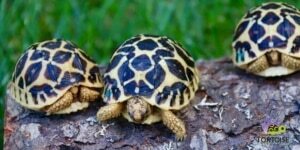 Some tortoises are prone to obesity, if you notice soft skin tissue protruding past the edge of the shell or your tortoise having difficulty getting all its limbs and head inside the shell. Then cut its meals back and consult an expert. A good quality vitamin and mineral supplement is essential to the well-being of your tortoise, always read the manufacturer’s suggested dosage. We suggest a good pinch Nutrobal 2 out of 3 meals. Be sure to mix in well as some animals have been known to pick around it. Failure to maintain a good supply of vitamins and minerals may result in irreversible illness such as metabolic bone disorder. Also provide a clean cuttlefish (not from the beach) for your tortoise to rasp at, it will help to keep your animal’s beak at the right length and provide it with additional calcium.